In order to solve this problem effectively, we provide developers with mechanisms to delay non-critical requests, batch requests together, and detect when the network conditions are best for a given activity. 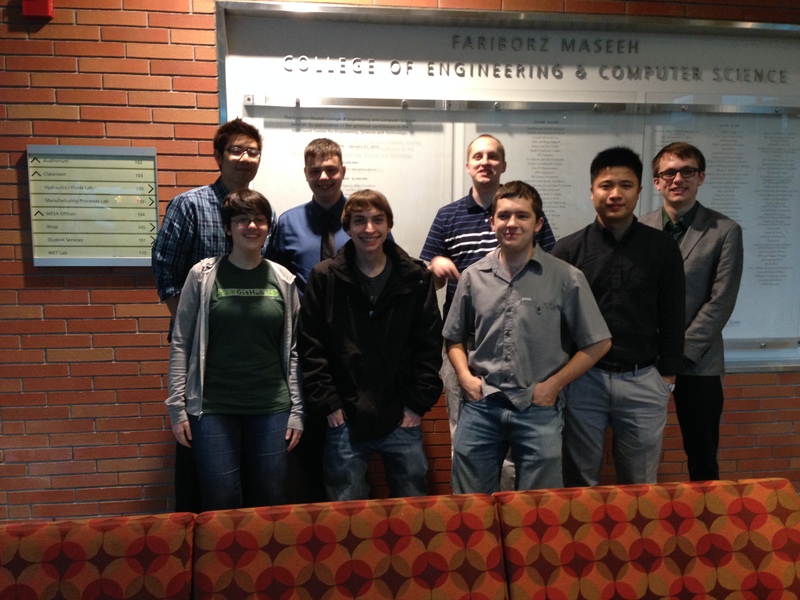 This involved doing research to determine the efficacy of various solutions. Regardless of the effectiveness of our APIs, this research provides insight into saving battery usage. In addition to our research, we also focused on the developer ergonomics, hoping to make this easy for developers to use. Installation of the library is simple: clone the “dist” folder and choose the library variant that best suits your needs. LocalForage is used in the library for storing the statistical details for each XMLHttpRequest (XHR). This way the developer can perform analysis to develop a set of dynamic heuristics such as utilizing when the user is most likely to make successful XHRs. However, if this is something you do not think will be commonly used, you can opt for a LocalForage-free version to get a smaller library memory footprint. We encourage you to check out our General Usage section and API Usage section to get a comprehensive idea of usage and context. A brief overview of how to use the core functions of the APIs is provided. Where url indicates the endpoint, data is the parameter you pass JSON data to (i.e., POST XHR), success is called after the request has completed successfully, and the optional method parameter specifies the HTTP method to use (e.g. Patch, Post). If method is not specified, and the data field is null, GET will be used, but if data is used, POST will be the default. Here’s how timeout works: given a number of milliseconds, the XHR added (and all other XHR in the queue) will fire off if the queue is not already fired off by some other mechanism such as a critical request firing. XHRs are stored within LocalForage. There are a variety of functions to either retrieve the data or trim it. General retrieval syntax is in this format, where callback is an array of XHR-related objects that contain data relevant to the XHR such as start time, end time, and size of the request. In order to gather data about the effectiveness of our APIs on reducing battery usage, we hooked up our reference device (a Flame) to a battery harness and used our demo app to process 30 requests of various different types of media (text, images, and video). All three tests were run on a WiFi network (our university’s WiFi network, specifically). 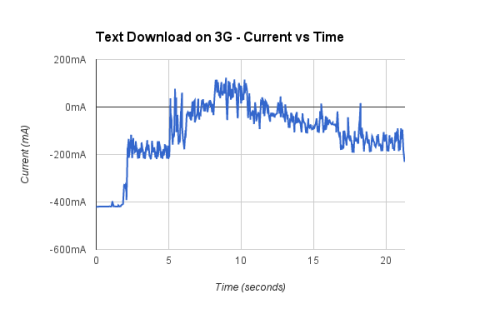 We attempted to run all three tests on a 3G (T-Mobile) network, but due to poor connectivity, we were only able to run the text test over a cellular network. When running the tests on WiFi, we noticed that the WiFi chip was extremely efficient. It would turn on almost instantly and once all network requests were done, it would turn off just as quickly. 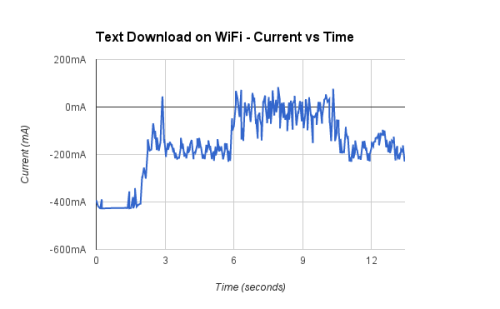 Because of this, we realized that the library is not very useful when on a WiFi network; it is hard to be more efficient than instant on/off. When testing on a 3G network however, it became very apparent that this library could be useful. On the graph of power consumption, there is a very clear (and relatively slow) period where the chip warms up, increasing its power usage gradually until it is fully powered. Once all network activity is complete, there is an even longer period of cool down, as the power draw of the chip gradually declines. It is clear that stacking the requests together is useful on this type of network to avoid dead periods, when the phone is powering down the chips due to lack of activity just as another request comes in, causing chips to be powered back up again at the same slow rate. In conclusion, we believe our library will prove useful when the cellphone is using a 3G network and will help conserve battery usage for requests that are not immediately necessary. Furthermore, the optional data analytics backbone can help advanced developers generate unique heuristics per user to further minimize battery drain.